The quite knowledgable Wallace Wyss wrote here in September 2016 that The 1999 Bentley Continental SC Is A Future Collector Car. He was right – RM Sotheby’s sold this 2000 Bentley Continental SC at their recent Arizona auction for $246,400 (inclusive of applicable buyer’s fee). Now comes the model I am recommending for sainthood, or, I mean “potential collector status,” the SC. For this design the Bentley boys reached back into the time machine and pulled out a flamboyant roof style that harkened back to pre-war Bentleys, and was even seen in a few postwar Bentleys (saw one at the Palm Springs Desert Concorso of 2015, on a Mk. VI or R-type chassis, the Sedanca de Ville). The name “Sedanca” goes back to a type of carriage with a slide back front roof. This was carried into motorcars up until the late ‘30s and then simply died out in popularity. I would venture to say these models are not going to go any lower in price and will soon go upward once their special status is recognized…. Resurrecting a body style unseen since the Classic Era, the Bentley Continental SC was a limited-production sedanca coupe, featuring a full tinted glass roof with a two-piece removable section above the driver’s seat, similar to the “T-top” of a modern Camaro or Corvette. When removed from the car, the panels fit into a special padded, carpeted hold within the trunk. Just 73 examples of the model were produced between late 1998 and early 2000, and they remain highly sought after by collectors of significant Rolls-Royce and Bentley models. Maybe we should pay more attention when Wallace Wyss predicts a future collectable car? This Bentley Continental SC may have set an auction record price for this model. All photos by Robin Adams ©2018 Courtesy of RM Sotheby’s. Maybe we should pay more attention when Wallace Wyss predicts a future collectable car? 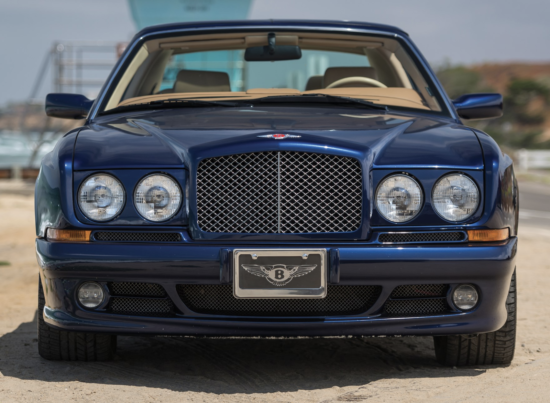 This Bentley Continental SC may have set an auction record price. The T-top cars have a center bar holding the two tops rigid in the center. This center bar is absent on this car. How did the 2-section top remain rigid while in place with no support in the middle? Forgive my ignorance, as I have never seen or heard of this model before. Thank you for enlightening me! I checked an auction company. At Amelia Island an almost identical one was sold by RM. It also has no center bar. If you could see how complex the locking mechanism is you would see there is no comparison with Detroit’s T-tops. Not on pricing. I ran across a 1999 SC wide body on Craigslist.com with the removable roof panels 1999 BENTLEY CONTINENTAL SC ROLLS ROYCE – $150000 in Phoenix on Craigslist. Oddly they list it as a Rolls Royce in addition to Bentley, maybe that was before the two companies were torn asunder.